"What the heck. This is bread, not birth control." Creating a sourdough starter is a great achievement but unlike most baking endeavours, it doesn't end there. In fact, it need never end if you nurture it with love and attention. I wrote about making a sourdough starter recently and one of the challenges was working out how to maintain it. Here are my beginners notes. If the starter is warm, the yeast grows faster and needs more feeding. If the starter is cold, the yeast grows more slowly and needs less food. If the starter is too sour, feed it more regularly. When I made my sourdough starter a few weeks ago, I got to the stage where I had a mature bubbly starter. It felt like the moment when I brought Sylvia home from hospital and thought, it's a baby, now what do we do. Fortunately as the top quote from Susan suggests, a starter is far easier than a baby. In a panic about what to do with my starter I searched online for advice. Wild Yeast and King Arthur Flour gave me useful advice. Then I invited my friend Kathleen over for coffee and advice because she had been a regular baker of sourdough bread at one stage. Books, blogs and forums have all be useful in gathering information, but best of all is chatting with an old friend. My jug in which I keep my sourdough starter. There is the option to keep the starter out on the bench (with a lid) and feed it twice daily. Though in Bourke Street Bakery: the Ultimate Baking Companion they advise against this in warm weather when it might grow too fast. It seems practical for those who bake bread every few days. That is not me. I chose the second option to keep the starter in the fridge (with a lid). A cold starter grows at a much slower pace with a far smaller appetite than a warm starter. Most of the online information I read said you need to feed a starter in a fridge about once a week but Kathleen said she did it about every couple of days. The fridge is the more forgiving option. 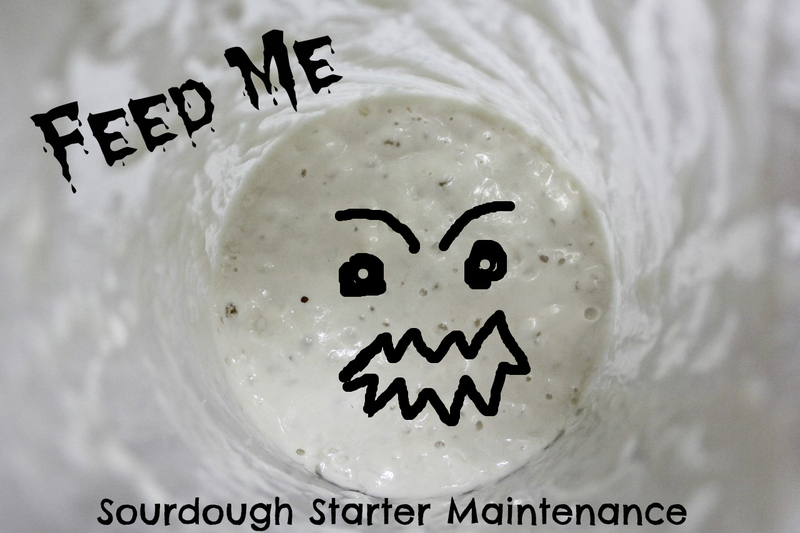 If you forget to feed your starter it is less likely to die but may need pampering, depending on how it looks. Like most things with sourdough, there are bazillions of ways of feeding a starter. I have seen all sorts of ratios. I keep about 100g of starter (toss off the rest - see below) and then I add 100g white flour and 100g water (often cooled water from the kettle). This is a good rule of thumb for me though I often have a bit more than 100g of the starter. 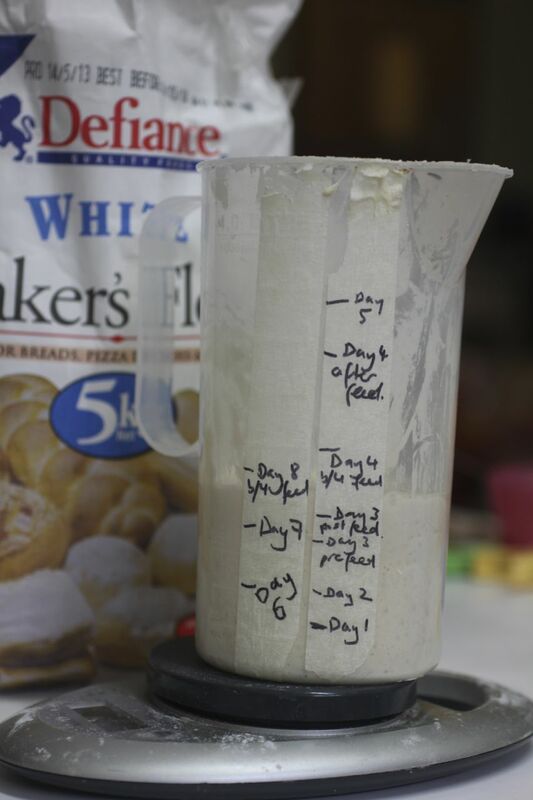 This means it is about 100% hydration because it is equal amounts by weight of water and flour. I've started buying flour in larger bags since starting to bake sourdough. (29 August 2013) Since writing this post, I had my starter smelling of nail polish about a week ago. Fortunately I had reassuring advice from friends Kathleen and Yaz to say that starters can be rescued. I read forums and followed advice. It seemed that my starter was hungry (I had returned it to the fridge after feeding and leaving for baking bread and perhaps should have fed it before storing). I read that feeding it frequently helped so I did that - even three times on one day, keeping it out of the fridge and watching it so that I fed it every time it doubled in size. I also made sure I was reducing it to quite a small amount (between 50-100g). After 5 days I started a new loaf which was quite sour but very edible. 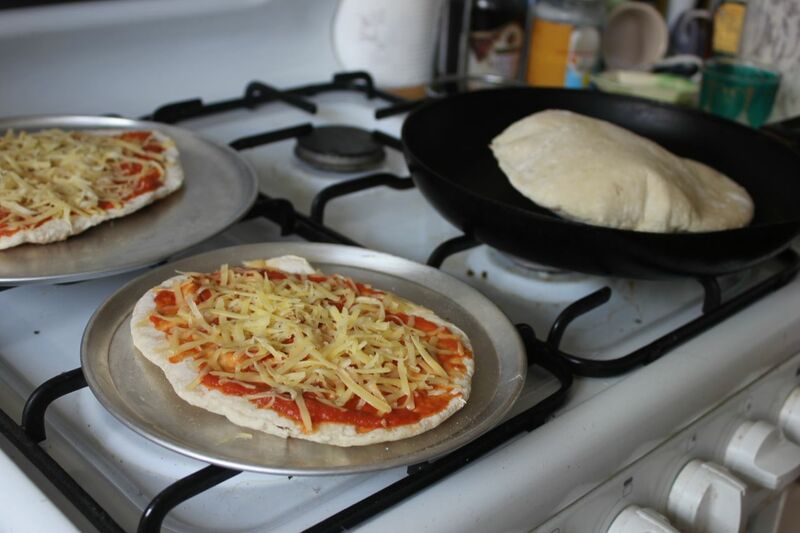 To the right is a sourdough flatbread ballooning up on the frypan. I tried baking these as pizzas which were good but not great. It is ok to throw out the toss-off but it can be incorporated into baking. 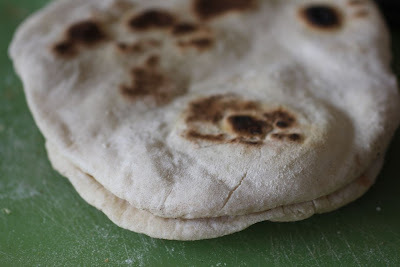 I have managed to use quite a bit of mine in making these sourdough flatbreads with starter straight from the fridge that has not been fed. We all love them. I tried making them as pizza - both by cooking on the stovetop or prebaking in the oven before adding toppings but they seemed a bit stodgy this way. I really like this recipe because unlike so many other sourdough recipes, it gives instant results. Be warned though, I managed to set off the fire alarm while frying these! Sourdough flatbreads. Great with a curry, a dip or a stew. Mix all ingredients. It looks quite too shaggy and dry. Knead and it should come together into a smooth - albeit fairly firm - ball of dough. Cut into four. Roll out each portion into about a 0.5cm thick oval on a lightly floured board . Heat a heavy based non-stick frypan over a high heat. Place a disc of dough onto the pan. Heat for a few minutes or until it balloons up and brown spots appear on the other side. Flip over, flatten with an eggflip or spatula and fry another minute or two until you have some brown spots on the other side. I tend to brush out the flour from the pan (with a kitchen towel) before frying the next one so it isn't covered in burnt flour. Best eaten on day of frying. 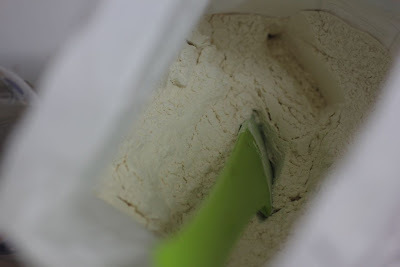 *Note: I have also reduced the amount to 200g of starter and 180g of flour when I don't quite have enough starter and it works fine. Do you maintain a sourdough starter? Any feedback or other advice on maintenance is welcome. I started a starter last month, but then we went away for a few days before it was really ready, so I had to throw it out. I should get around to doing it again when I have a clearer calendar, because I do love sourdough bread. We have a starter that the boyfriend uses for almost everything. My favorite would be when he makes pizza. It's super delicious and the bread has that sourdough crust which is to die for. I have never been much of a baker but I enjoy watching my boyfriend make loaves of bread and pizza! This is the part about sourdough baking that scares me the most. I'm sure I would forget about feeding the starter given I couldn't remember to change the water in my soaking olives on an ongoing basis. The feeding process sounds similar to how I made Ethiopian sourdough injera flatbreads with teff flour a few years ago. Thanks for the handy tips as I would like to try this at some stage! Thanks Mel - it is scary - mine has been a bit neglected this week so hopefully it will be ok. Goodness knows how it will be next month that is even crazier but hopefully it will cope with my lifestyle - that is what I am still testing! I can see why bread making is an art as well as a science! Having neither a baby nor a sourdough starter I confess to finding them equally overwhelming (well, maybe the baby a little more so), but I am loving reading about your discoveries. The flat bread looks excellent too. The flatbread looks delicious! I might have to give that a go sometime (and will remember to take the battery out of the smoke alarm). I love sourdough bread. But I have gone to making mine in loaf pans. For myself, I eat less, and it makes for better sandwiches and toast. The main difference is that I add 1 gram of instant yeast to a 1200 gram batch. This helps with the rise in the loaf pan.